The Big Town | WHAT A FEELING! If your cinematic tastes run to rain-spattered streets under neon lights, skeletal sharpies with razor-creased pants leaning against lampposts, and brassy dames dishing out the what-for, then The Big Town may be just the ticket. It delivers all of those things in aces. On the other hand, it doesn’t do much with those things—simply wraps them around a conventional storyline. But it’s a passably enjoyable two hours, for various reasons. The conventional storyline is the one about the small-town kid (Matt Dillon) who’s handy with dice, and who heads to the big city to make his mark as a gambler. In this case, the big city is Chicago, 1957. This is the kind of movie in which everybody keeps telling this boy, “Jeez, kid, you’re good with the dice, maybe the best I ever seen.” It follows that the kid gets involved with the local gamblers and has an incredible streak of luck. Romantically, he’s caught in another well-worn dilemma: Does he throw his affection toward the stripper (Diane Lane) down at the Gem Club? Or toward the nice girl (Suzy Amis) who lives away from the neon side of town? For a while, he throws his affections like dice. Eventually, he’ll come to a predictable conclusion. The producer of The Big Town, Martin Ransohoff, is an old pro, and he knows how to mount this sort of good-looking production—the music, sets, costumes are a pleasure. He’s also gathered quite a good cast, including a bunch of notable names in supporting roles. Tommy Lee Jones, for instance, does very tasty work as the nasty organizer of the town’s most freewheeling game. Bruce Dern and Lee Grant play Dillon’s shady financial backers; Tom Skerritt is enigmatically cheerful as a gambler who has a very old secret. 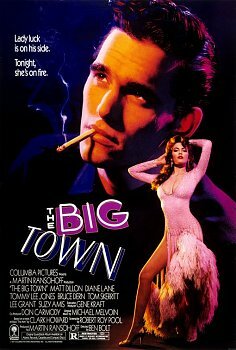 But, believe it or not, the finest work in the movie is done by Matt Dillon. During his teen years, it appeared Dillon’s sullenness would overwhelm him (even in Coppola’s The Outsiders and Rumblefish), and he’d be a goner once he outgrew his acne. Well, the kid can act. This is the first film in which he looks like a full-fledged movie star, and it’s crucial, because he essentially has to carry the film. It’s a graceful performance, full of the nervous energy of this sharpshooter but without tics or gimmicks. One other name to note: Suzy Amis, the good girl, will be someone. Maybe not right away, but someday. You read it here first. The screenplay was written by Robert Roy Pool and directed by Ben Bolt, who has done nice work for TV. They don’t quite lift The Big Town into the big leagues, but they organize the action competently, which is just enough to make the thing work. I’m telling you, you heard it here first. But go easy on me—it is as hard to predict the careers of actresses as it is the careers of starting pitchers in the major leagues; too many things can go wrong, regardless of the raw material. So I guess Suzy Amis simply tore her rotator cuff, or its equivalent. I’m surprised my youthful self did not say more about Diane Lane, who’s hard to ignore in this movie. But Dillon deservedly gets the kudos, and Drugstore Cowboy was just two years away. The Big Town was such a flat-line that none of the good stuff, or the bad stuff, really mattered. This entry was posted on Thursday, March 31st, 2011 at 3:00 am and is filed under 1987. You can follow any responses to this entry through the RSS 2.0 feed. You can leave a response, or trackback from your own site.